It had a shabby french look to the base and the lampshapde was just a simple burlap. Not to mention it was only $20.00 bucks, so Home it went. So what do you think, go more, or keep it less? 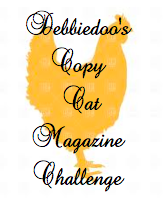 I WILL see you back here Sunday evening for the Magazine copy cat challenge. REMEMBER...there will be NO newbie party this coming MONDAY, the magazine copy cat challenge is in lieu of IT! Hard choice. It looks really good like that. But it came out great, so more could be cute? Great shade. What a steal ;) Maybe have it like this a bit, then add more later and it'll be NEW again! 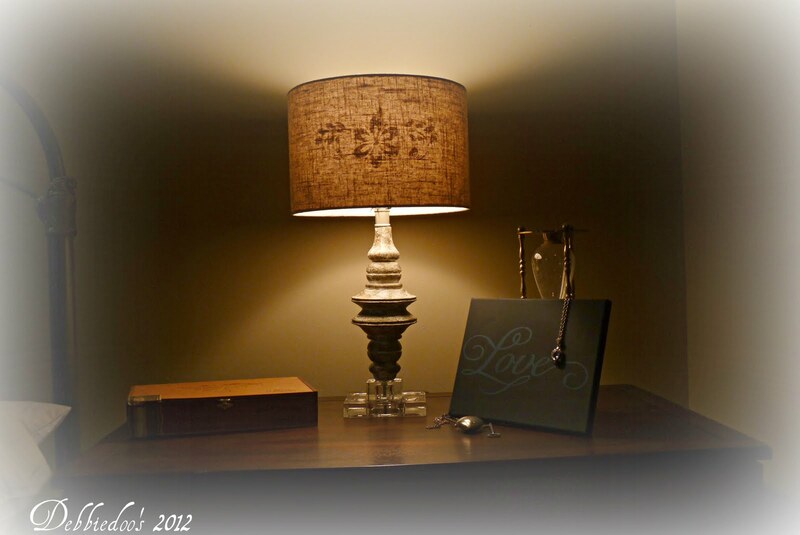 Love the lamp and I like the subtle approach so thats enough..
that was a great find at a good price too. Nice lamp. I think what you've done is just the right touch. Debbie, you won't believe me, but my daughter and I just did something very similar today. We are redoing her whole bedroom and, at the same time, trying to reuse some of the items she already had. I love your lamp! I think it looks beautiful just like it is. Very elegant! I like it just like it is. Simple. I love this shade and lamp! I think you did a great job with the stenciling... less is more! Very pretty, and I love that it's simple. 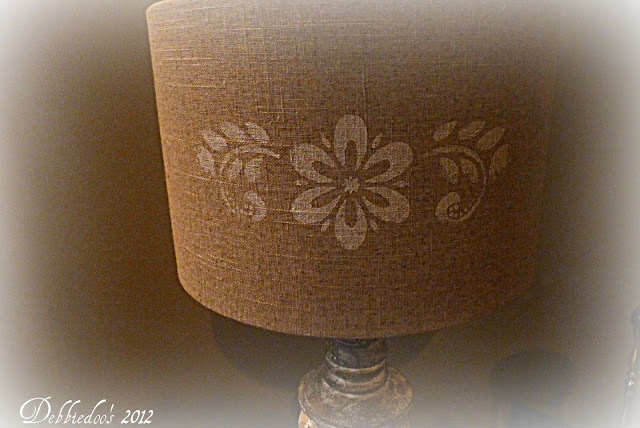 Hmmm… Wonder where I could use a stenciled drum shade? You are becoming quite the stencil-er. I like the lamp just the way you did it. Very cute just as it is! Pretty!! I like it the way it is, but then I am trying to simplify things right now anyway. What a great lamp for only $20!! I love the stenciling you did on it. It looks great! I like it like this, but if you add more, I would add a bunch! I say simple or extreme :) have a great weekend! Very pretty! I love how just a little bit of paint can totally freshen up a look. Thanks for sharing. I like the look of your lamp now.. the color is great. I would like to try this on a lamp I have all ready... the price was right also! I would keep it as is...looks outstanding Debbie. 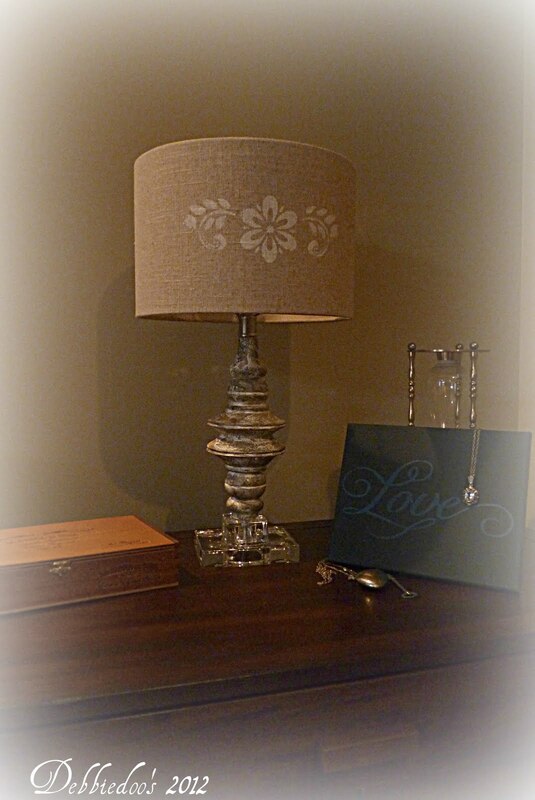 What a pretty lamp and I love how you added the stencil to the shade! I think it's perfect!! Oh, I love it exactly the way you have it. It's simple with a just a little splash of something extra. I have a shade just like that, Debbie! Isn't it horrible that I was thinking what I could do to mine, too! What is wrong with us that we can't just leave things alone. : ) At any rate, I like the simplicity of the stencil as you have it now. I really love how that turned out! I am a "less is more" gal, so I say it is perfect the way it is. If you have too much on it, it will look busy (like a patterend lampshade) and you'll lose focus of the simple flower design in the middle. I like the simple and elegant. Looks great. I love it just like it is - perfect!!! I love it! Simple & pretty, I think it's perfect as is. Thanks gals, I will leave well enough alone for now! It looks fantastic! Why am I such a chicken to try things like this!!! Oh isn't that just so VERY Sweet... I think it is PERFECT!!!! Love the Lamp Base... VERY PRETTY!! Cute! Love it simple, chic! Debbie, it looks awesome just the way it is! What a great lamp! Darling! I had a stencil in my hand today at Home Depot, but it wasn't quite what I was looking for. I will keep looking! I think it is perfect just the way it is!!! Debbie you are the crafting queen!! Definitely less is more in this case. I think it looks really sophisticated as it is, and it complements the base very well. Love it the way it is...simple! Have a wonderful weekend! It turned out so unique, and personalized, Debbie! Just pretty! Love the look now, but I say go for more:) Is the copy cat challenge any certain theme this time? Looks great, Debbie! Have you tried to stencil on the reverse side of a pillow cover? If I were as good at stencils as you are, I'd flip over the covers I bought this morning. Come visit and see what I bought. You know I love lamps and that lampshade now has your stamp/stencil! 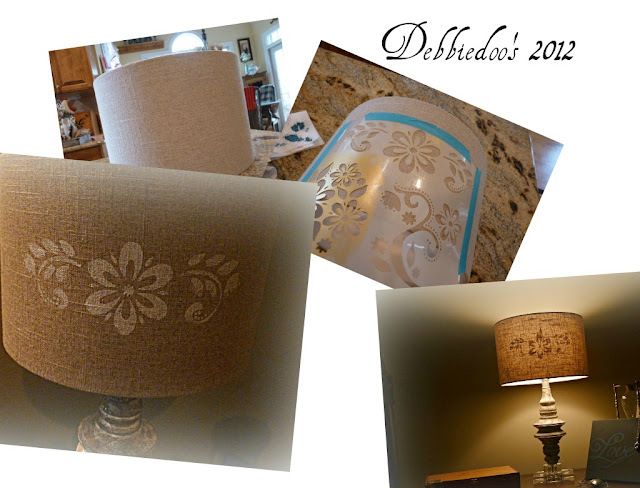 Debbie, I like the lampshade just the way it currently is stenciled . very pretty and the lamp base really does rock the look ! Oh and have fun at the 70"s party -anxious to see pictures. I think it looks great "as is". Love all your ideas, you really inspire me! Can't wait for the copy cat challenge!! I didn't make it for the copycat...been a tad under the weather. Maybe next time. Oooo, I LOVE this!!! I think I'm falling back in love with stencils!! This looks perfect!!! I love it just like it is...this looks like it was soooo much more than $20! Don't you love finding things like that? This gives me an idea to "fancy" up a plain linen shade I got at Wally World for $13...can't wait to break out the stencils.